This maintenance kit includes one PrinterTechs compatible fuser, 4 feed/separation rollers, 1 manual feed tray pickup roller, and *bonus* : 1 manual feed tray separation pad, and 8 D-shaped pickup rollers -- these parts are not found in the kits sold by HP and most of our competitors. 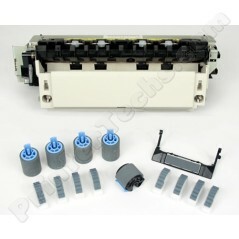 For use in the HP LaserJet 4000, 4000N, 4000TN, 4000DTN, 4050, 4050N, 4050TN, 4050DTN. Note: a transfer roller is no longer include for the reasons stated below. You can save money by purchasing the fuser on exchange -- see exchange terms in details below. Our Premium Roller Kits have 2.5 times the grip! 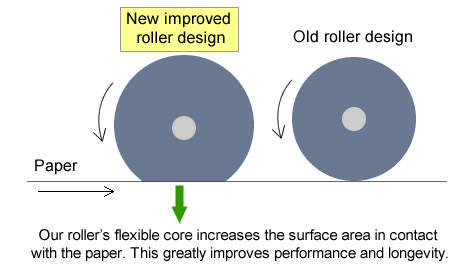 Printertechs Laserjet 4000 and 4050 premium feed rollers have a flexible core. This provides better paper grip and greatly improved longevity. Approximately 2.5 times the grip of standard feed rollers! Not all fusers are built the same. We test printer parts from all over the world and we only select the best. The picture to the right shows some of the fuser fixing films that we have tested from leading suppliers. Most of them work on plain paper but all of them failed our stringent testing on envelopes, labels, and heavy-stock letterhead. Many companies use these films in their refurbished fusers and consequently toner doesn't completely bond to thicker stock. Our fusers are built and tested to work on plain paper, labels, envelopes, and letterhead.